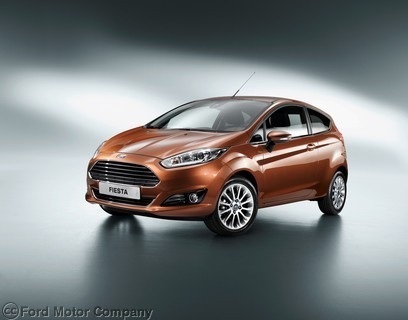 2014 Ford Fiesta will be the first to have the highly praised 1 liter, 3-cylinder engine with unreal gas mileage. Customers in the US shopping for an ultra-fuel efficient vehicle, but who don’t have enough money to pay for a hybrid, never mind a budget-busting electric car, will soon have a choice with the 2014 Ford Fiesta. Ford has announced that the new Fiesta is expected to achieve the highest fuel economy of any non-hybrid vehicle sold in the United States. That will mean the Fiesta will have mid-40s miles per gallon, maybe more. That the vehicle can achieve this is novel, but its engine is the really unusual element in the story. The new Ford EcoBoost 1.0 liter engine is a 3-cylinder. Not long ago (yesterday?) many folks considered a four cylinder engine too small. Turbocharging helps. Advanced fuel injection technology and variable valve timing helps. The problem for car makers is that those things also help 6-cylinder engines. So in the dealership the fours always seem a little weak next to the competition – their siblings with more powerful units under the hood. But “the fix is in” as the saying goes. Ford followed Hyundai’s lead in killing the 6 cylinder in its most popular sedan, the Fusion. It now offers 13 different four cylinders (actually it is less) that all have a variety of torque and horsepower ratings, some of which land right on top of one another. Clearly, a less expensive engine that still worked was needed. Welcome to the three cylinder. The cylinder count matters little here. Velocity Channel’s Fifth Gear tested a Ford with both the 1.0 EcoBoost and the 1.6 liter EcoBoost and they were basically the same in terms of performance – horrendous. 0-60 in over 11 seconds. 11 seconds is scary slow. Slow like the 18 wheeler in the right lane can over-run you as you feebly attempt a merge onto a freeway. However, many don’t care. For many buyers, this is a level of performance they will accept either for budgetary or environmental reasons. Some never use the performance they have anyway, so why not buy only what one needs? Fifth Gear rated the 1.0 EcoBoost very highly and liked it better than the 1.6. Ford claims 25 percent fewer moving parts in the new 1.0 3-cylinder. It also notes that the engine uses new technology never seen before. Instead of an energy-consuming counter-rotating balance shaft to eliminate vibration to an acceptable level, Ford is using parts of the engine it already had. Bob Fascetti, director, Ford Global Engine Engineering explained in a press release; “We really focused on reducing the amount of energy the 1.0-liter EcoBoost engine uses by paying very close attention to such things as bearing sizes, piston ring tension and thermal management. For instance, we decided not to use a balance shaft in the engine because it adds weight and increases friction or parasitic losses. So we balance the engine externally with the crankshaft pulley and flywheel.” Ford is also using a new timing belt , crankshaft, oil pan, and cooling system design. The timing belt is actually in contact with engine oil. It will be interesting to see if Ford can match Chevy’s new Spark’s timing system which does not consider its drive mechanism (timing chain) a maintenance item. Ford deserves a lot of credit for its innovation in terms of fuel economy, and despite the fear of change, it is very likely that the new 1.0 EcoBoost will be loved by its buyers. When will we see the Ecoboost in E-series Vans? I need a new van soon.... and may have to go with Sprinter unless Ford comes out with a more fuel efficient Van.